The worse thing about love is not the pain that comes when it is lost. It is the realization that the opportunity for love was present, but we let it slip through our fingers. The lingering regret it causes can be downright unbearable at times. This is something that circus strongman Zampanò (Anthony Quinn) tragically realizes too late in Federico Fellini’s La Strada. By all accounts Zampanò is someone who the audience should care little about. He is a brute that uses force to get compliance from others; treats women like objects; and has seemingly made a career out of a chain breaking routine that feels like nothing more than a cheap parlour trick. One wonders what a woman like Gelsomina (Giulietta Masina) sees in him in the first place. Purchasing Gelsomina from her poor mother to be his assistant, the same position her sister Rosa held before she passed away, their relationship feels more like master-slave than equals for most of the film. Zampanò treats his new aid as nothing more than a wide-eyed puppy in need of being broken in. Despite this though, Gelsomina holds on to her idealistic hope that they are meant to be together, even when men like the Fool (Richard Basehart), a mischievous rascal in his own right, seems to show her the type of affection she seeks. 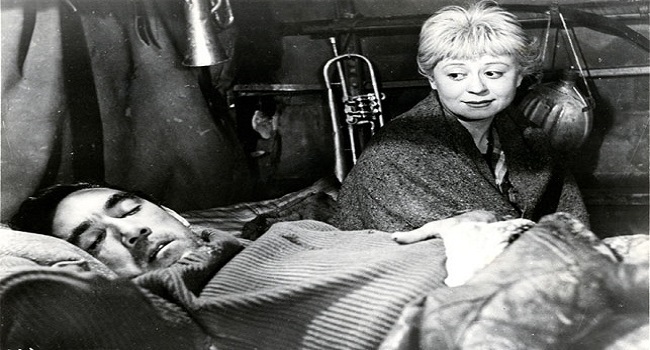 Fellini’s La Strada may employ Taming of the Shrew style comedic tropes, and be set within the confines of the spectacle of the circus, but it is really an intimate and tragic look at the way unrequited love impacts the rise and fall of Gelsomina. Giulietta Masina is sensational in the role of Gelsomina. Her eyes, more specifically the way she effortless uses them to convey emotion, are simply mesmerizing. Giving a performance that is on par with the likes of Charlie Chaplin and Jacques Tati, Masina manages to move from innocent curiosity to sly humour to devastating sadness in the blink of an eye. 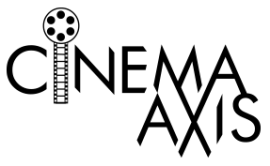 She brings a sense of hope and optimism to both the film and Zampanò’s life, though the latter is too blind to see it. When she embraces the philosophy that everything has its purpose, it is both a source of strength for her and a subtle nod to fate which has brought her and Zampanò together. It is through her that the audience realizes that the pair are not as different as Zampanò tries to trick himself into believing they are. The more he tries to evoke his superiority, the clearer it becomes that he is a wannabe King who is really nothing more than a pauper living in a filthy mobile home. Fellini exploits this further by alluding to the drunken madness that will befall on the rest of Zampanò’s life. One in which the tune that he once taught Gelsomina to play will serve as a haunting remainder of his lost chance to experience true love. Providing a wonderful blend of comedy and tragedy, and anchored by Giulietta Masina, Fellini’s La Strada, much like the circus itself, is a film full of surprises. Excellent commentary. Makes it sound worth watching. It is definitely a film that is worth watching. Funny and tragic. This was a sad but compelling story. I don’t normally enjoy this type of movie, but La Strada was well done. I could see why it received the praise that it did. I am glad I gave it a chance as well. I did not expect it to have such a sad ending, but thought it fit the film perfectly. This is one of my all-time favorite films as well as well as a favorite of mine by Fellini. The ending is so heartbreaking to watch as it did make me cry the first time I saw it. Giulietta Masina. Anything she did with Fellini is gold as I love her in this yet my favorite performance of hers is in Nights of Cabiria which she completely owns every scene she is in. There hasn’t really been anyone like that as she just exudes that charm, grace, and melancholia all into one. I really need to check out Nights of Cabiria and the rest of Giulietta Masina’s work. I was amazed by how easily she conveyed her acting range in this film. Excited to see how she approached her other roles.